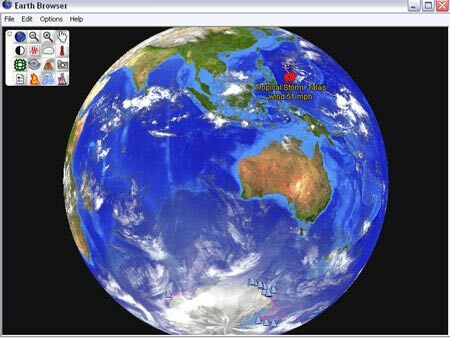 Earth Browser is a beautiful 3D representation of the globe, stitched together from satellite images. The globe itself rotates on a starlit or black background and can be zoomed to reveal considerable surface detail. Country labels, political boundaries, a co-ordinate grid and plate boundaries offer some of the functions of a traditional atlas, but Earth Browser is much more! When connected to the Internet, the program dynamically updates itself from a number of online databases that allow it to display detailed, real-time information, including active volcanoes, recent earthquakes, cloud animations, icebergs, tropical storms and accurate weather station data. Much of the information is hyperlinked to the appropriate web site. In addition, there are links to many web cams, most of which are of surprisingly good quality, and sited in interesting locations. City lights and realistic earth shadows complete the simulation. 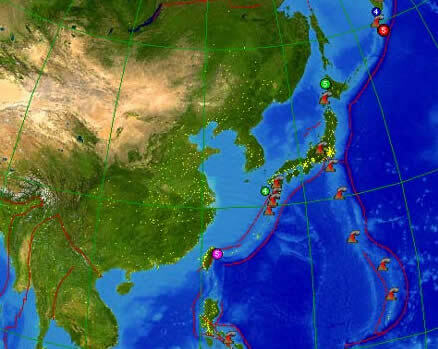 Detailed view of SE Asia with tectonic plate boundaries, active volcanoes, recent earthquakes and city lights activated. In use, the program is very intuitive, with hints and context sensitive labels guiding the way. Some features such as country labels only become visible as resolution is increased. Students will take seconds to become familiar with Earth Browser. The program has a simple help menu and user manual. Technical support is available online and is remarkably efficient, getting back to me within 24 hours with a solution to the menu problem I experienced with my laptop. I have heard reports that EarthBrowser is not particularly happy on slow PCs or with interactive whiteboard software running in the background. It does like a nice fast internet link. Since it is distributed as a free-ware program it is perfectly possible to try a risk free installation to see if it will work in your classroom. There are not many differences between the licensed version, which costs a few dollars, and the free trial, but you are able to zoom in to higher resolutions and see all the functionality of the software including web cams and plate boundaries once the registration fee has been paid. KS2/3/4 Investigate to find the world's most hazardous country. KS3/4/5 Make connections with hazardous events in the news. KS3/4/5 Forecast the arrival of weather fronts. KS3/4 Prepare action plans for named places using the real time information, for example "Tropical Storm Talas is approaching the Philipines. How many people are in danger? What advice needs to be broadcast on the radio and television networks?" KS2/3 Follow the exploits of sailors like Ellen Macarthur, by plotting their course on a map and predicting weather patterns iceberg hazards and storm events. KS3/4/5 Investigate temperature anomalies along a selected line of latitude. KS3/4 Use the physical map to locate deforestation in Brazil. KS2/3/4 Investigate population distribution with the city lights feature. The list represents about 15 minutes of thinking! I may try to develop some of these ideas into more detailed lesson plans in the future. How can I get Earth Browser?